Craving a high chair that’s safe, stylish and simple to use? Feast your eyes on the brand new Baby Bjorn High Chair! When I was asked to review the latest creation from the clever crew at Baby Bjorn, I was of course thrilled to road test anything from such a respected company. However, I was extremely attached to my Ikea Antilop high chair. But I have to admit, I’m a convert, and have fallen for the slick styling, safety features and ease of use the Baby Bjorn High Chair provides. This high chair has certainly attracted a large amount of “oohs and ahhs” from visitors to our home. Its slick lines and compact design have obvious mass appeal. But, as parents, something that looks the goods must also live up to the hype. The Baby Bjorn High Chair does. Setting up the high chair was a breeze, and done in minutes. The beauty of the Baby Bjorn lies in its simplicity. It’s a matter of putting your child in, lifting the tray into place, and locking it. Anyone who’s had to deal with a ravenous child will know just how important a quick seat is! Take a look at just how easy it is to assemble and use in the video below. I was intrigued at just how straight my son was sitting in the high chair, proud and ready to roll! The backrest is moulded to hug the child’s back. Once the tray is up, it can slide into one of three positions, to ensure it’s snug against the child. One of my main concerns was whether the high chair would be “grandparent-proof”. I can vouch that, at least for my parents and in-laws, it proved easy to operate after one simple lesson from me. And the praise only continued with intense glee that there are no straps and harnesses to battle with. Cleaning the Baby Bjorn High Chair literally takes minutes, with a simple wipe down, and no hidden areas for food to hide. And the tray lifts off for a quick rinse in the sink, or you can put it in the dishwasher – bliss! 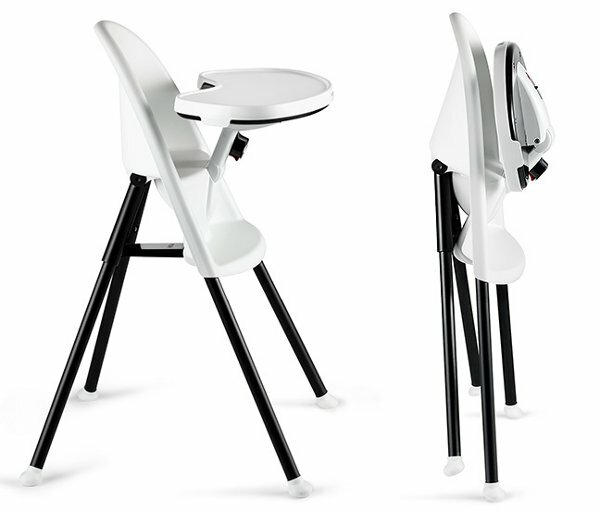 And if you’re in need of a space saving high chair, the compact design is perfect for tight spaces. If you’re searching for a high chair that’s safe, easy to use and will last though many, many children, the Baby Bjorn fits the bill. Suitable for children from six months up to three years (my two-and-a half-year-old fit into it quite comfortably), it’s available from Minimee for $299.95.